Kanji Invaders: Japanese Typing Game at Khakionion.com! Type the readings of the falling Japanese words! Kanji will transform into hiragana after a while. Get the best score possible by typing quickly! Need Help? Click any of the [?] marks you see. Romaji is simply writing Japanese with Roman characters. Kanji Invaders reads Romaji input and converts it to Kana. 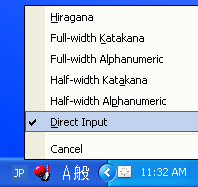 This is done for maximum compatibility; normal English keyboard input is Romaji. If a certain romaji letter doesn't seem to work for you, let me know and I'll fix it! The Japanese Language Proficiency Test (JLPT) is an internationally recognized test of Japanese ability. JLPT defines five levels (N5-N1) of competency, with N1 being most advanced. I've tagged the Kanji Invaders dictionary with approximate JLPT level information, so that you can study for a particular exam, or just select them all if you want lots of Japanese typing practice. To change which kanji you're using, simply reload the game. Kanji Invaders' JLPT and English definitions certainly wouldn't be complete without Kodansha dictionaries, and occasional lookups in Peter van der Woode's JLPT Study Page and Jim Breen's WWWJDIC. Updated regularly. See Khakionion.com for more stuff. Email your comments!